Federal Minister for Information Technology and Telecommunication Dr. Khalid Maqbool Siddiqui has said that the penetration of broadband across the country is vital to digitalize Pakistan. The Federal Minister was addressing the contract signing ceremony of the project “Broadband Coverage for North Waziristan Agency, Frontier Region Bannu & Frontier Region Lakki Marwat”. The contract was signed between Universal Service Fund (USF) and Jazz. He said that government will continue to work towards achieving mission of broadband penetration at every corner of the country to facilitate masses. The Federal Minister congratulated teams of USF and Jazz for doing such an incredible job. This event marks one of the greatest landmarks achieved in the field of IT and Telecommunication, he said. He further said that this project in North Waziristan will help bridge the digital divide by providing services to unserved communities and open-up new horizons for them. Khalid Maqbool Siddiqui said that in Pakistan, the socio-economic development is directly linked to provision of ICT services and it is endeavor of government to bring all parts of country at par with each other. He said that government is committed for promotion of Information and Communication Technologies (ICTs) facilities in the country. 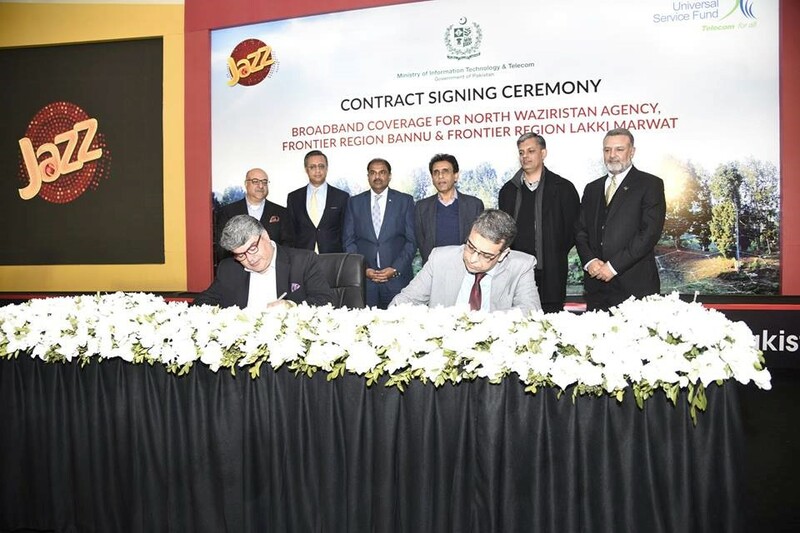 Also speaking at the ceremony, Rizwan Mir, CEO-USF said that with the signing of North Waziristan contract, Universal Service Fund had taken yet another step to provide voice and data services to remote and underserved areas of Pakistan. He added that this network would be completed in 24 months for providing 3G/4G and Voice Services to a population of 0.57 million in 401 unserved Mauzas. He further said that with the improvement of law and order situation in FATA areas, provision of advanced ICT infrastructure would be a key to the development efforts in the region. He said that we enjoy great support from Ministry of IT and Telecom as well as the ICT industry in our common mission to aggressively work towards the vision of broadband for all citizens of Pakistan. He mentioned that USF was planning to launch several new broadband projects in the next few months, including one in South Waziristan. While addressing the audience, Ali Naseer, Chief Corporate & Enterprise Officer at Jazz said “Jazz and USF have a common goal, which is to bridge the prevalent digital divide in the country. This is why the project has special significance for us and in due time residents of 401 administrative muzas will have access to the country’s fastest mobile broadband connectivity. We are looking forward to assisting these people in unlocking their potential in an increasingly connected world”. It is noteworthy to mention here that this project will help bridge the digital divide by providing services to unserved communities. It would also open-up new horizons for the people and provide them e-commerce and a host of other services that they could not have imagined a few years back. Digital and e-services are a rapidly evolving field and can provide better health, education, agriculture and business opportunities to the people in these areas. In order to execute this project, 28 towers will be installed by Jazz in under 24 months. Senior officials of the Ministry of IT, Jazz, USF, PTA and representatives of IT and Telecom companies were also present at the event.